In yesterday's update, we talked about the fact that a new low would give the decline off the all-time-high a pretty solid five-wave structure, which would go a long way toward confirming a trend change at intermediate degree. This is because one of the key tenets of Elliott Wave Theory is that the market moves in five waves when it's traveling in the direction of the next highest degree of trend, and in three waves when it's moving against the larger trend. 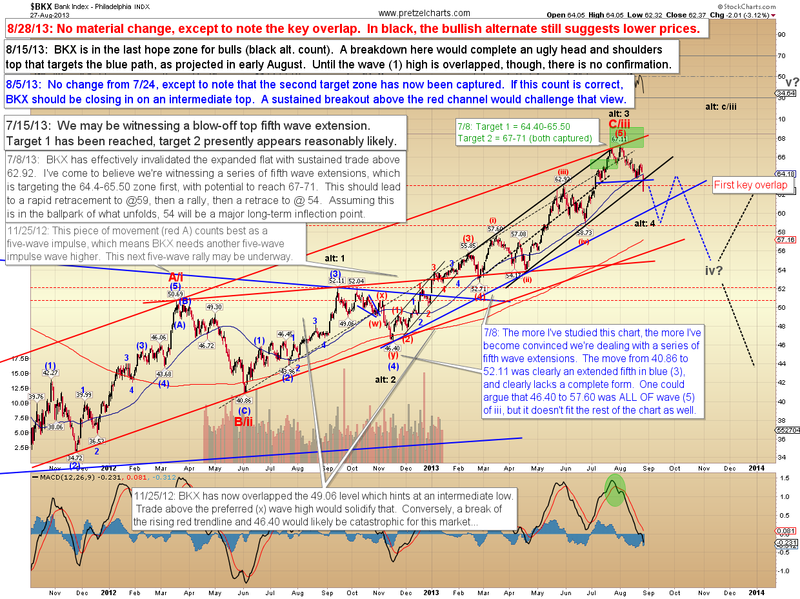 The five-wave decline therefore suggests that the larger trend is down. There are only a few exceptions to this rule, and one such exception is a pattern called an expanded flat. I talked about that pattern in some detail last week, so I won't rehash it here. Suffice to say this is a game of probabilities, never certainties; so there are always potentials which are more bullish or bearish than whatever presently appears most likely. 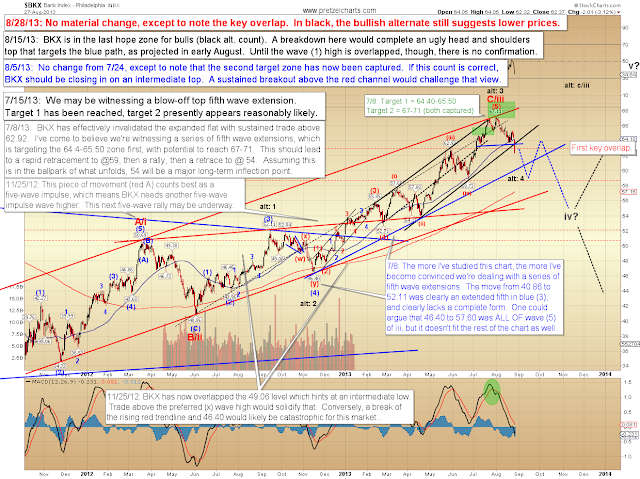 Presently it appears most likely that the trend has shifted. The market reserves the right to blow that up, of course, and if that starts to appear probable, I'll certainly discuss it in more detail when the time is right. 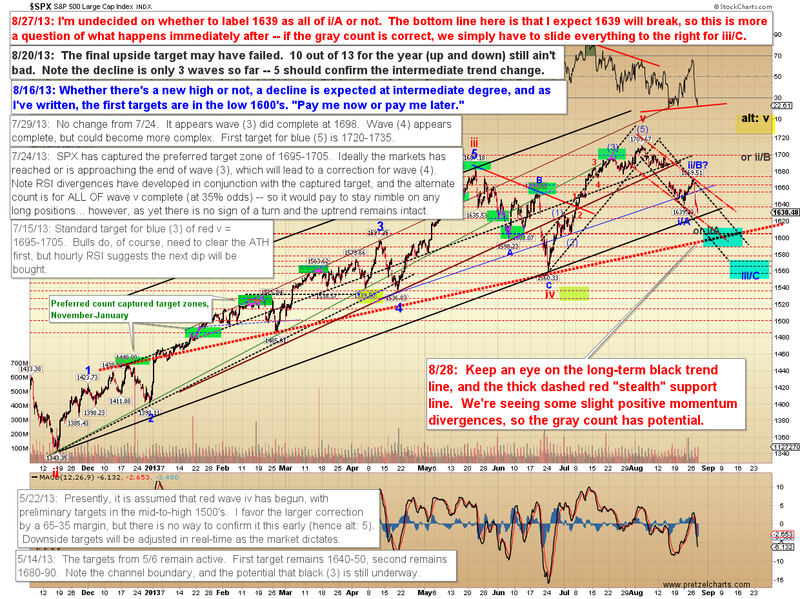 For the moment, though, there's not much to give me a warm-and-fuzzy feeling toward the intermediate bull prospects. Let's start off with the Philadelphia Bank Index (BKX), which has been an excellent bellwether of the market for quite some time. BKX has overlapped the prior peak and completed a head and shoulders top. We'll start off with the daily chart, then zoom in a bit on the second chart, with some additional detail on the alternate count. Unlike the Dow Jones Industrial Average (INDU), for example, BKX has not yet formed a large five wave decline, and has still left open the option for an ABC. However, on the 30-minute chart below, we can see that even this more bullish alternate ABC count still suggests lower prices for the near term. 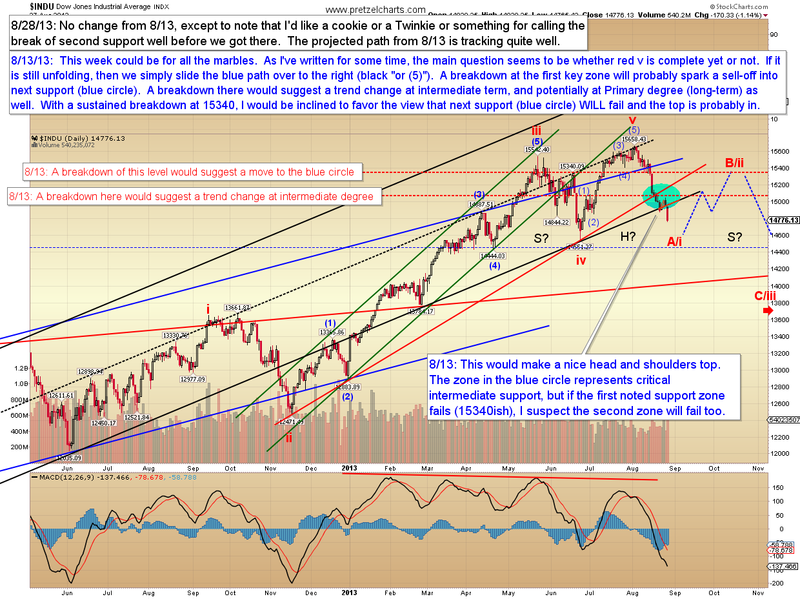 Speaking of INDU, the Dow has a very clear five wave decline. Yesterday I talked about the potential that the current decline (which hadn’t technically happened yet) could be wave five of the larger structure. 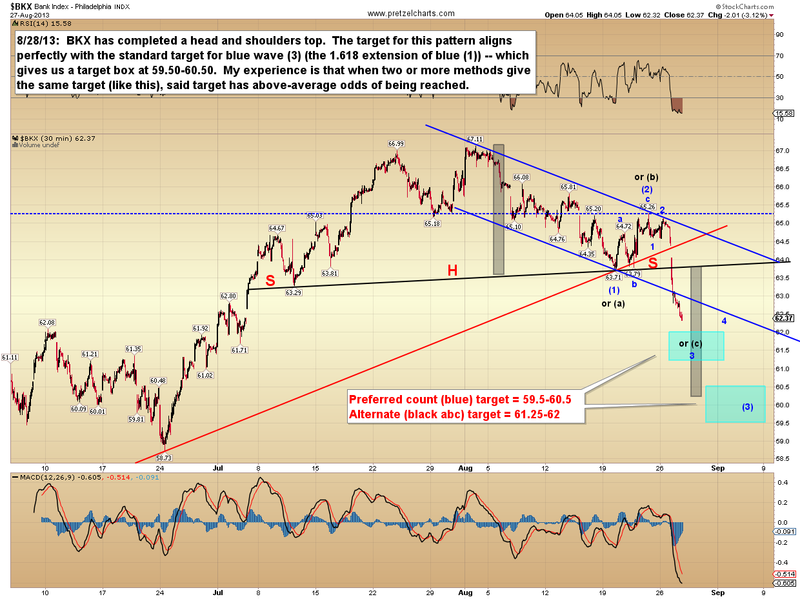 When we look at INDU’s chart, that leg probably “looks” best as a fifth wave. 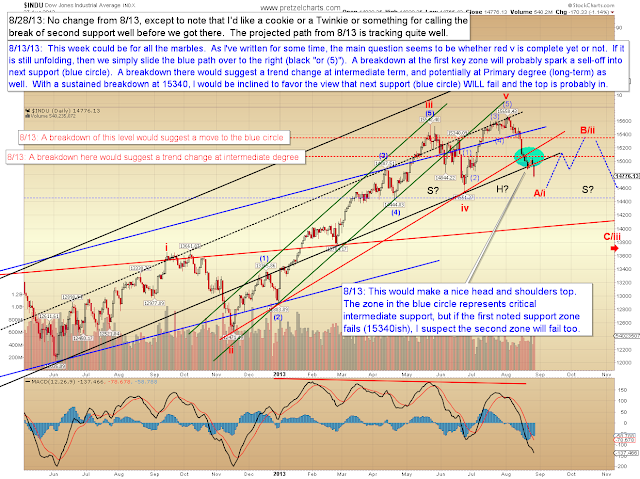 If yesterday’s drop was the fifth wave, it could complete this first leg relatively soon. From a near-term perspective, it appears the current leg has at least a bit further to run -- but we should stay alert to any pending noteworthy bounces as a signal that the larger wave B/ii relief rally may be beginning. The S&P 500 (SPX) is approaching two potential support zones, and is currently showing a slight positive divergence. Positive divergences can quickly be erased though, so that’s just one thing to be aware of. If the blue count is in play, there won’t be much relief for bulls for a while, but if the gray count is in play, there may be a bottom approaching in the not-too-distant future. Bears have the black and red dashed trend channels working for them at the moment, though -- as long as the market continues channeling, this is a clear bearish trend. In conclusion, SPX and INDU both have solid five-wave declines now in place, and that does suggest the larger trend has changed to bearish. At some point, we can expect a solid bounce to develop, and further anticipate that bounce will be followed by at least one more large leg down of equal or greater length. Trade safe.